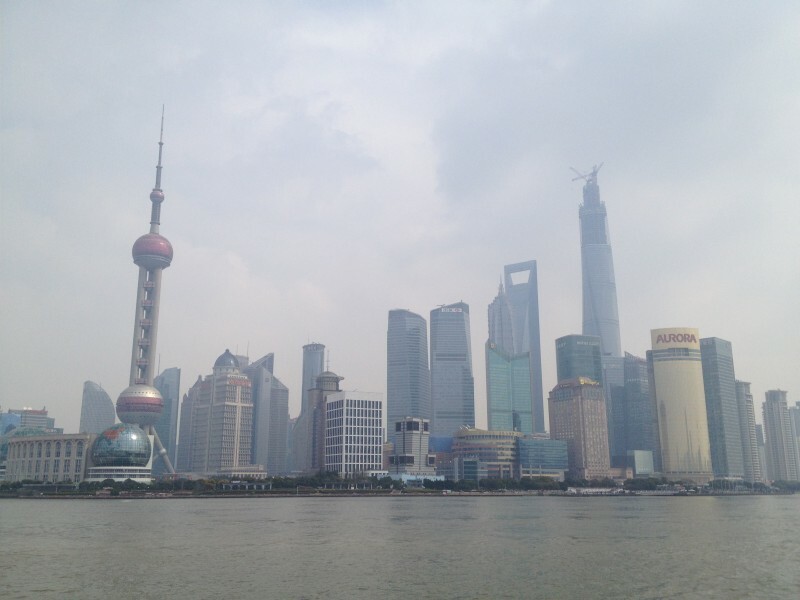 The way out of Shanghai made the biggest impression on me. A dull rain battered the taxi’s windshield as we flew along the highway towards the airport. Ubiquitous tall apartment buildings – skyscrapers, by another city’s standards – huddled together on either side for miles and miles and miles in an endless parade. My amazement grew when I began to consider how many people must inhabit them. And they wouldn’t be single occupants; Chinese people live with their families. I multiplied all the buildings by all the highways by all the residents, and realised firsthand the enormity of just this one Chinese city’s population. 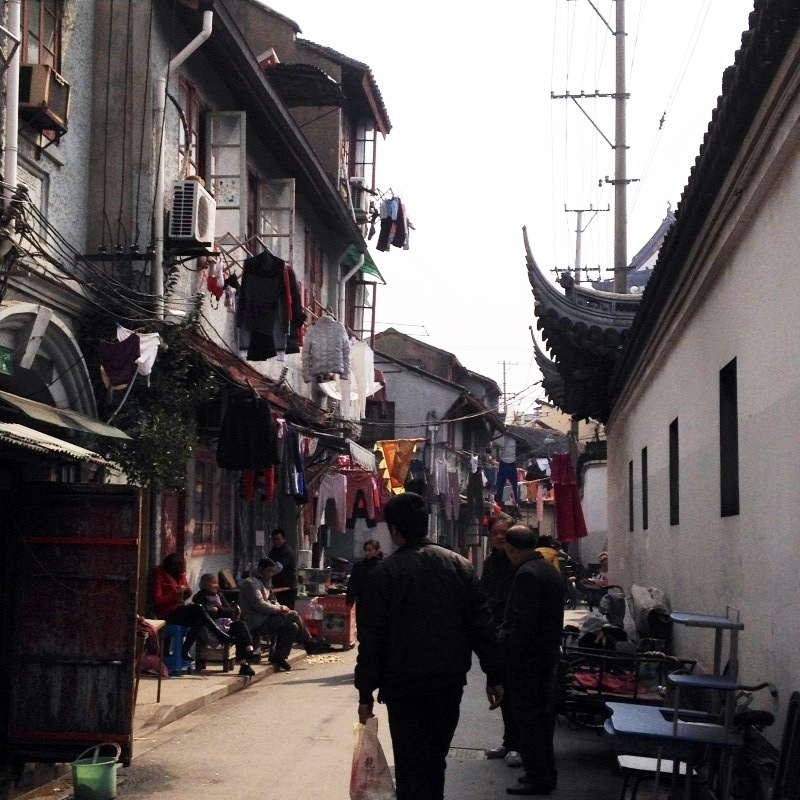 The density of occupants hadn’t phased me much as I roamed the Shanghai streets the previous three days. I’ve spent enough time in New York not to feel oppressed by crowds. I was in town for two days of work but had a free Sunday to myself. Although I stayed around the central core of the city, I was able to see quite a bit in even one day, on foot. I had never been somewhere that felt so exotic; I could have been on Mars, and I loved that feeling of being so far out of my comfort zone. Each night, however, I found myself well within my comfort zone at the luxury-oozing Four Seasons Shanghai. I forgave its near-total ignorance of Asian culture and decor when I was able to watch TV from my iPod on the treadmill’s screen. People stay at a Four Seasons for a taste of their Western-world home, not to be immersed in a foreign one. When an Italian businessman told me he barely left the hotel whenever his work took him to Shanghai, I nearly empathized. 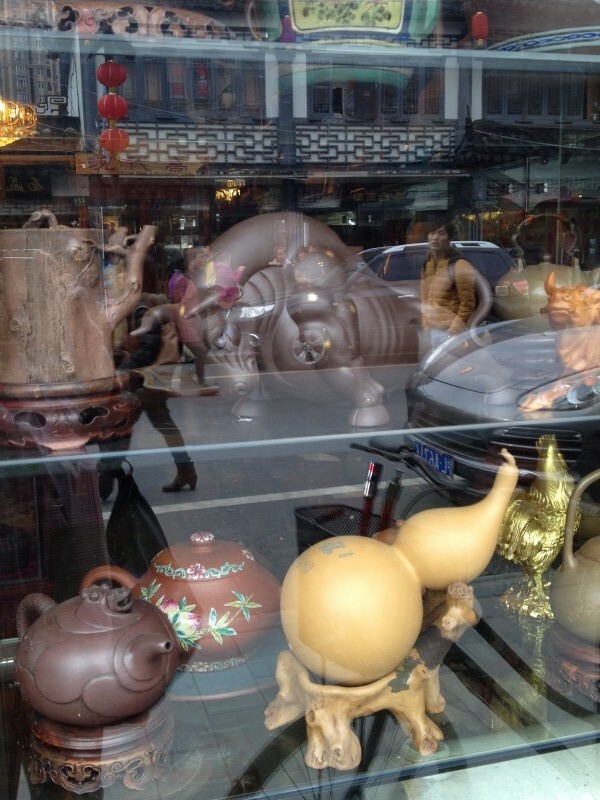 But then…I was in China! I flew out the front door an hour after dropping off my suitcase. Darkness had already fallen as the concierge hailed me a cab. I had been warned that most people don’t speak English, so getting around in Shanghai would be different from, say, Zurich, where a kindly multilingual local could steer you back on course.The hotel concierge had written my destination in Chinese on a piece of paper, Tianzifang, as well as the name and address of the Four Seasons for my return journey. My taxi got caught in a traffic jam caused by something unseen ahead. My driver gesticulated and ranted in Chinese, and I tried helpfully to translate. “Lots of traffic? Yes.” He glared, pointing at me, then the sidewalk nearby. Cars were everywhere, honking and intersecting each other. I couldn’t see any street signs and resolved to stay in the car. “I…you want me to get out here and walk? No…TIANZIFANG, please.” He glared again, apparently understanding my intent. Fifteen minutes later we steered around a stalled truck and he pulled over, 50 yards from where he had first pointed. 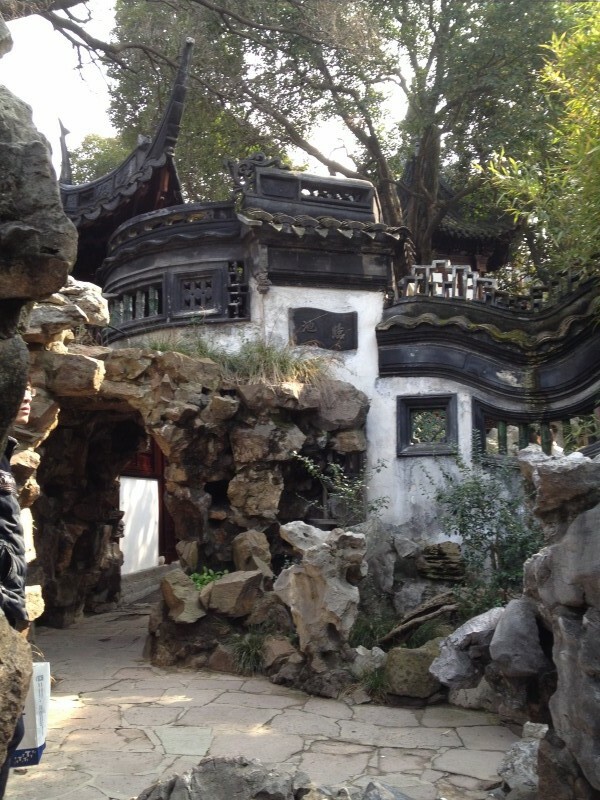 Tianzifang. 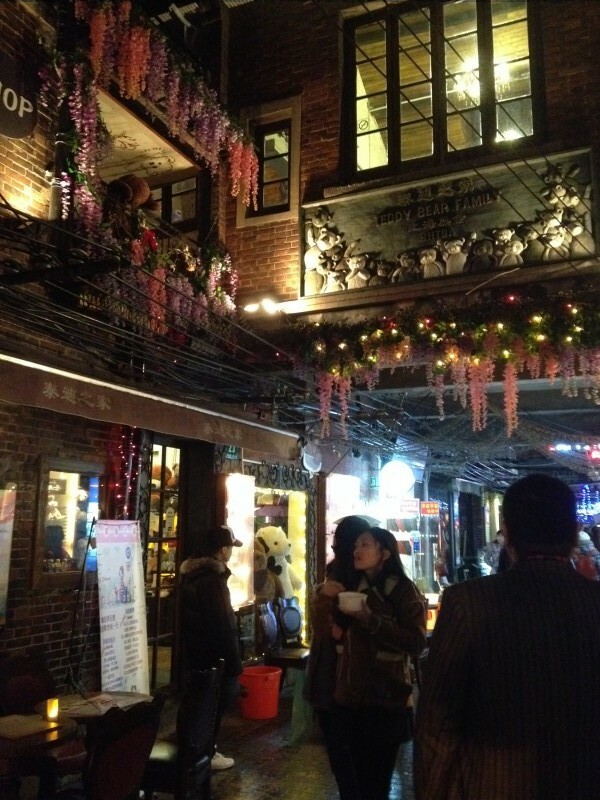 This utterly charming network of narrow lanes harbors shops, restaurants and art galleries. I browsed through the teapots, hats, jewellery, art, loose-leaf tea, chopsticks, and a million other things of extreme interest to non-Martians. I justified the purchase of a cheap pair of “pleather” gloves by telling myself at least they’re made in this country. Tianzifang borders Shanghai’s French Concession district, and old-world French influence beautifully complements Chinese. For dinner I pointed at a picture of a steaming noodle dish on a menu in an old French saloon-looking restaurant. The place still allowed smoking, but I later realized this is not uncommon anywhere in China, or Asia, for that matter. The next morning I set off from the Four Seasons, in Puxi, and walked slightly north, past the former home of Chairman Mao, to Nanjing Road. This main drag would take me all the way east to the Bund waterfront. Plenty of mainstream shopping opportunities lay on the way; major Asian stores compete with American Eagle and the like. They were easier to ignore than a five-floor department store that beckoned me in with cheap Chinese snacks of questionable origin. This mega-market offered every kind of household good, item of apparel and gadget I could want. This is China, after all, manufacturing capital of the world. I forged through the aisles of innovative products and modern luxuries looking for the ladies’ room. 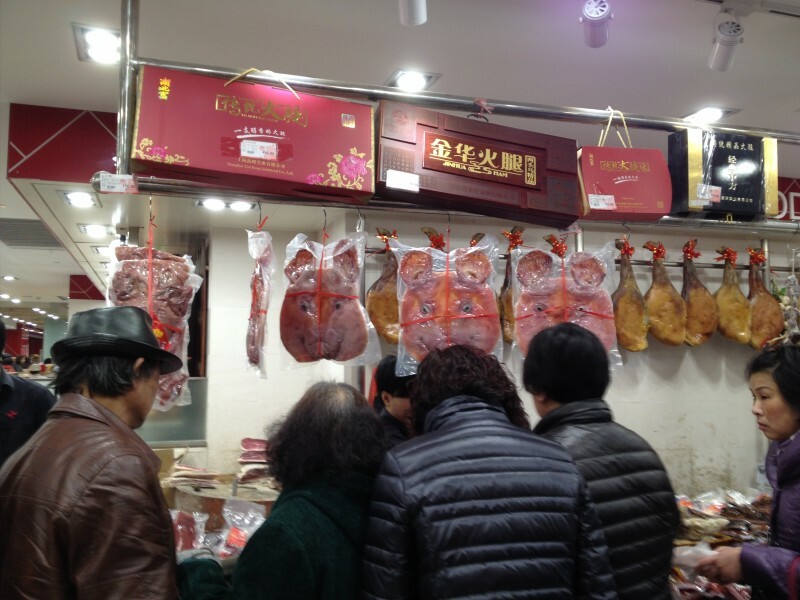 When I found it, I ended up a line next to the meat counter, trying to ignore the flattened pigs’ faces on display. Squatting over the ceramic hole in the floor of the ladies’ room stall, I thought about Shanghai’s sharp contrasts. High-tech meets old world in many corners of this city. Further along Nanjing Road I found the People’s Park. Six days a week, it’s just a park. 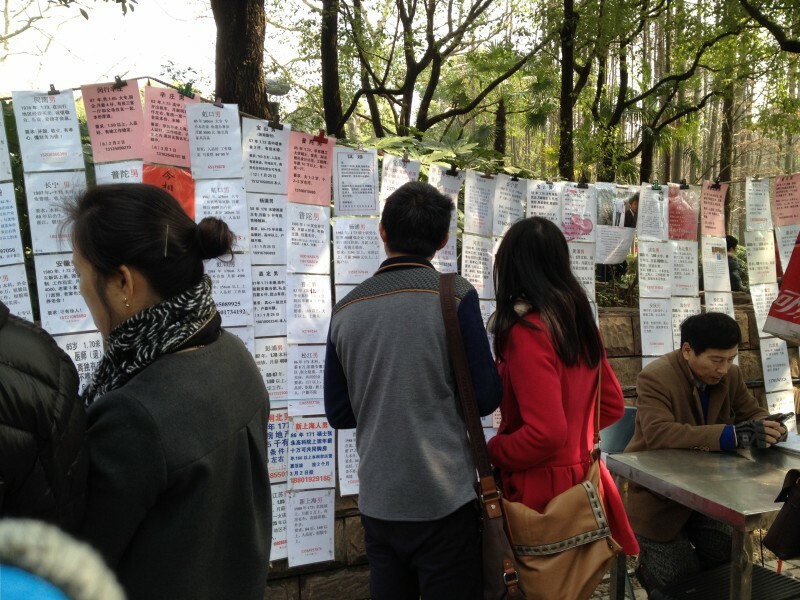 I was lucky enough to wander in on the seventh day and beheld the Sunday Marriage Market. I was puzzled at first, strolling past many open umbrellas along the paths. An umbrella sale? Or advertisements for something else? Around the umbrellas temporary walls were covered with paper blowing in the breeze. Mostly elderly couples and families paused to read them as they walked slowly through. I noticed one of the papers featured a photo of a young man, and felt like a bolt of martian lightning had struck: this man was “for sale”. He and hundreds of other young, eligible Chinese were being advertised. The target audience? Parents, grandparents and other family members entrusted with matching children to suitable mates, by description alone…I saw only that single photograph among all the hundreds of notices. The Bund, at the end of Nanjing Road, is the area along Shanghai’s Huangpu River waterfront. From the western side you can gape through the smog at futuristic skyscrapers on the opposite riverbank. Buildings on the west side of the Bund are all old European colonial, but the financial district across the water looks like a 1960s sci-fi illustrator’s dream. Financial district as seen from the Bund. Jetpacks included? Just a few blocks south of the Bund, you can enter Gucheng Park and head west, eventually reaching the justly famous Yu’yuan Garden. All my Asian-vacation daydreams were realized here, with a cheap ticket to explore the meandering stone paths. Little rounded bridges zigzagged koi streams and led up to quiet little temples holding totems of devotion. Huge chunks of jade sat patiently for generations of visitors, as incense burned in brass sculptures. Around the curved limbs of ancient trees I found cool stone caves and wooden doorways leading to more of the same. There were tourists aplenty, but who cares? This is old China. This is what the West cannot ever fully recreate, no matter how many bonsais we trim or cups of green tea we brew. The garden’s teahouse, by the way, does not require an entrance fee and is a magical place to spend an hour steeping your earthy tea selected from the lengthy list. 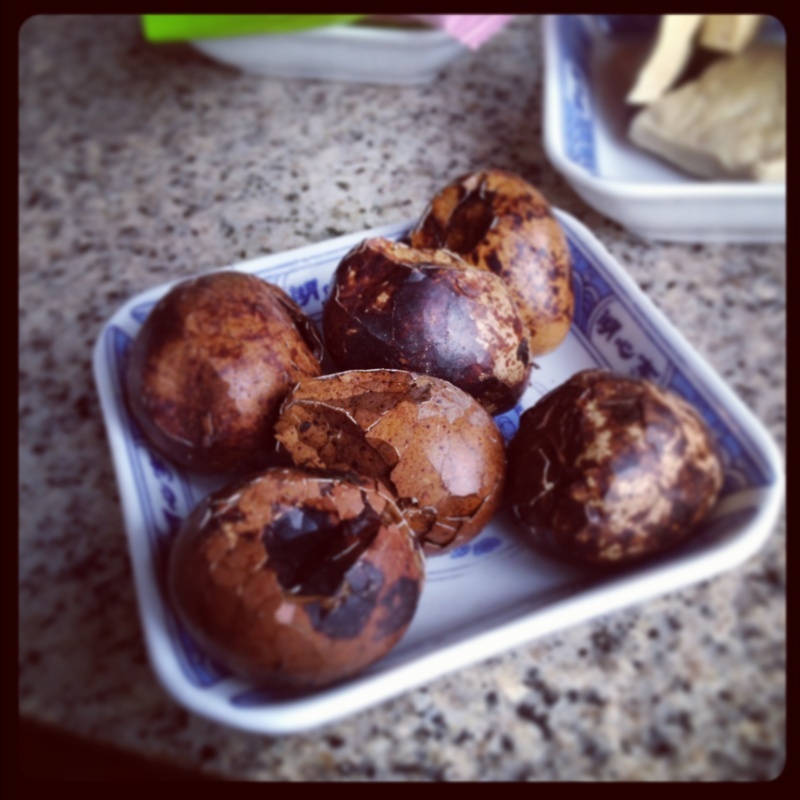 I became a fan of pu-er, said to offer life-giving properties, and of the snack of hard-boiled tea-soaked quail eggs. This part of town is teeming with old Chinese architecture and charming attractions, including a temple to the city god (ticket required). I’d held on to my shopping money up to this point, and was rewarded by the area just south-west of the gardens, Fangbang Road, and its myriad offerings of traditional Chinese gifts. Here are teas and colourful pots, silk slippers and brocaded, sequined fish. Chinese dresses can be bought without irony, and glass-bead bracelets can be had for pennies. I would never return to Shanghai without spending time in this bustling area; I’m sure it wouldn’t exist without tourists, but as one of them, I was grateful for the shopkeepers who bargained with me and humored me as I tried on six pairs of embroidered shoes. 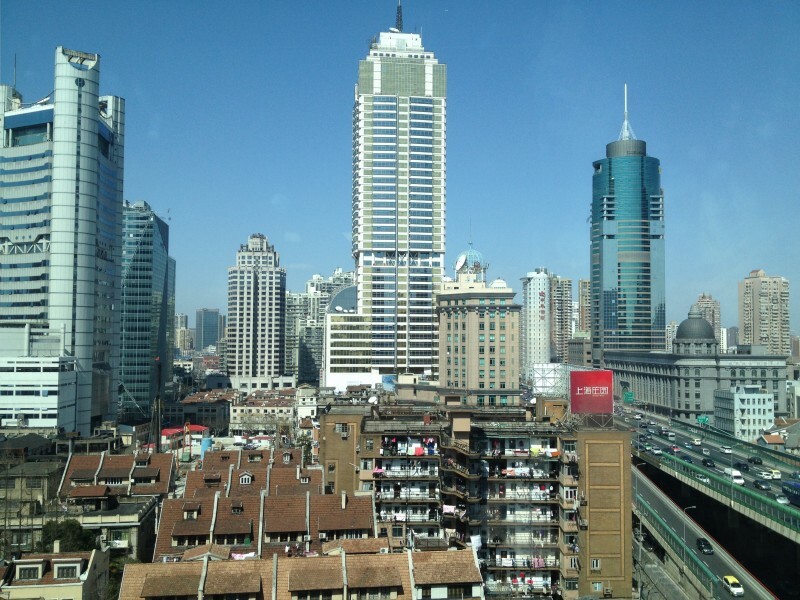 Shanghai is growing, fast. Construction projects that would last more than a year in other cities take a matter of months. From the vantage of a high building, you can look down and see evidence of the city’s past. Red-shingled rooftops top small houses clustered together, little fortresses from the past that will imminently fall to the future. Look close enough and you’ll see barefoot women hang their washing on the lines, and old men throw out water from their chamber pots in alleyways. In this cutting-edge climate of progress, these moments are a reminder of how far the Chinese have come, and what is possible. Staring at the rain-soaked apartment buildings on my ride to the airport, I thought about real China and the one presented to people like me, who duck in and out for a long weekend. As in so many cities, I was aware there is a front constructed for my benefit, and my dollars. That’s the part you can see in movies, and photographs. Actually being there – walking through the crowds, eating in random noodle shops and buying deodorant at a pharmacy – you get a glimpse of what it really means to exist here. The Chinese aren’t everything we’re shown by the media, and they’re no longer martians to me. 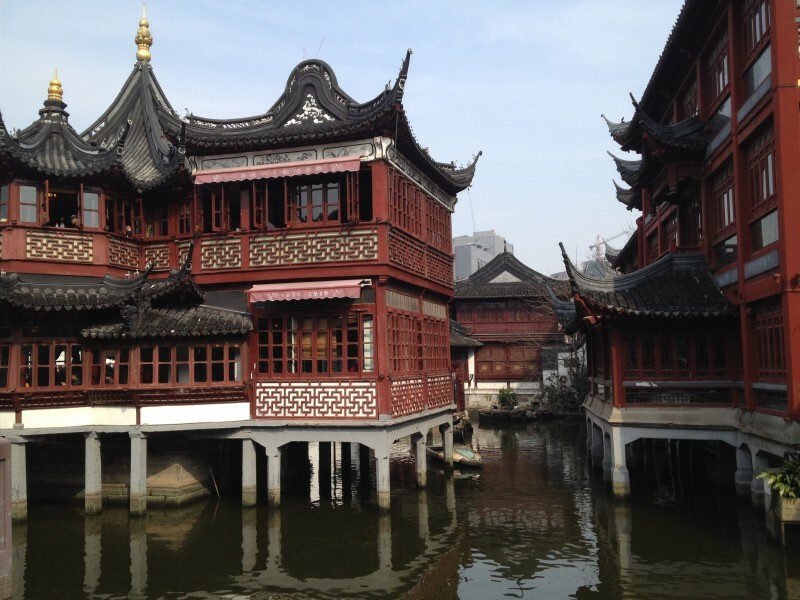 This entry was posted in Travel and tagged Four Seasons Shanghai, Shanghai travel tips, solo travel in Shanghai, Sunday marriage market, Tianzifang, yu-yuan gardens by aquixie. Bookmark the permalink.